It’s one of the most visible symbols of the health system — a maize and blue helicopter coming in for a landing on the helipads outside University Hospital. But it’s the high-flying crews inside those helicopters that help keep Michigan Medicine at the forefront of world-class critical care. The team from Survival Flight is a group of medical experts, specially trained in air medical transport, who help critically-ill patients receive the care they need — no matter where they may be. Here are some things you may not know about the Michigan Medicine department that literally rises above the rest. Survival Flight’s main job — to be available 24/7 to transport patients and retrieve donated organs — calls for a team of dedicated and talented individuals. The group comprises 23 nurses, 8 helicopter pilots, 8 airplane pilots, 6 mechanics and 10 communication specialists. Crews are based either at the Livingston County Airport or on the main hospital campus and work in 12-hour shifts. On top of facility-to-facility transport, the team is equipped to fly a helicopter directly to the scene of an accident to pick up a trauma patient or to assist the U-M Transplant Team in retrieving donated organs. 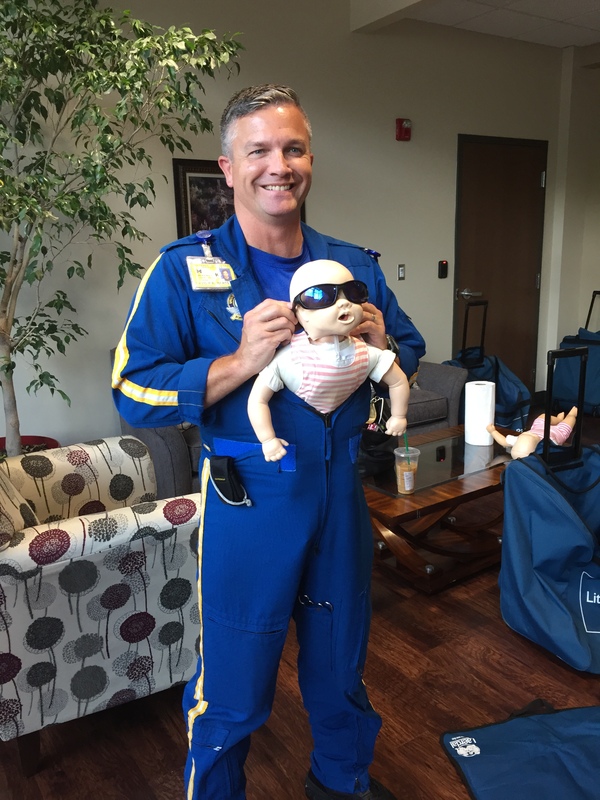 David Roberts is one of 23 flight nurses who work for Survival Flight. The group undergoes rigorous training and orientation. So how does Survival Flight carry out its missions? The department utilizes two helicopters and one fixed-wing airplane, each equipped as a mobile intensive care unit. The airplane is typically used for long-distance transports or in inclement weather conditions, while helicopters are ideal for shorter distances. The choppers, a pair of Eurocopter EC-155s, travel up to 210 miles per hour and have the versatility to land places an airplane cannot. They can carry more than 10,000 pounds in the cabin along with more than 300 gallons of jet fuel. The plane, on the other hand, can fly at more than 500 mph, allowing it to reach Michigan’s Upper Peninsula in less than an hour. 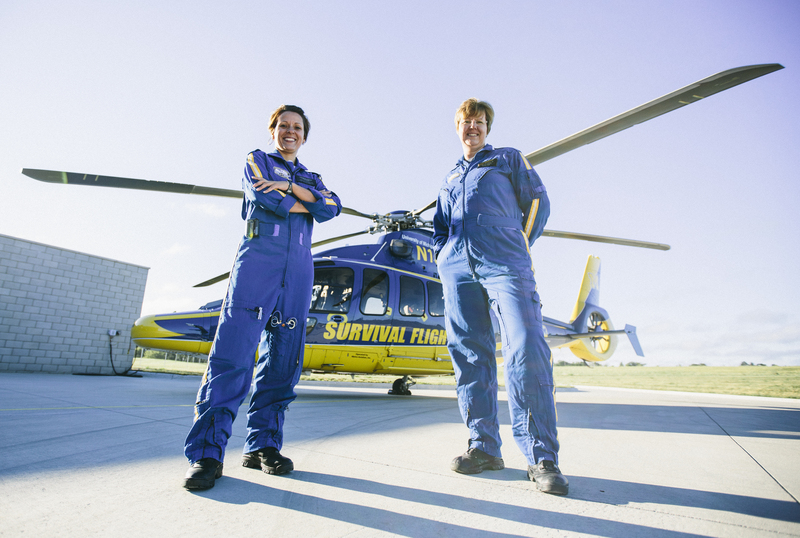 Nurses Joetta Vamos and Elaine Philipson pose in front of one of the two Survival Flight helicopters. “For a patient more than 200-250 miles away, it makes more sense to utilize the airplane,” said Tom Sherony, the aviation site manager for Survival Flight. The plane — a Citation Encore — reaches a maximum height of 45,000 feet and can withstand temperatures as low as -50 degrees Celsius. That makes long-distance travel possible and allows the Survival Flight team to fly as far as the Caribbean. While impressive, it’s not just the equipment that leads to incredible care, it’s the skill of the nurses and medical experts aboard the aircrafts. At the beginning of each shift, pilots and mechanics carry out a full systems check, while the medical crew makes sure the aircrafts are stocked and ready for patients. Ginger Abidin is one of 10 communication specialists who help coordinate flight plans and patient assistance on the ground. A group of Survival Flight team members. From L-R: Donna Robinson, Gina Russell, Joetta Vamos, Denise Landis, Mary Kay Autenrieth, Joe Mollinger, Diane Ruehs, Cindy Brown. While quick, the pre-flight process is thorough. Pilots study risk assessments, including looking at the weather across the entire flight path. If conditions are deemed too dangerous for flying, Survival Flight will dispatch ambulances on the ground to pick up patients. Meanwhile, the medical crew makes sure they have any specialized equipment or specific medications necessary to treat the patient, while communication specialists input flight plans. Along for every flight is a pair of nurses dually certified as RNs and paramedics. They have at least five years of nursing experience, are familiar with critical care for both pediatrics and adults and have undergone a rigorous orientation process. 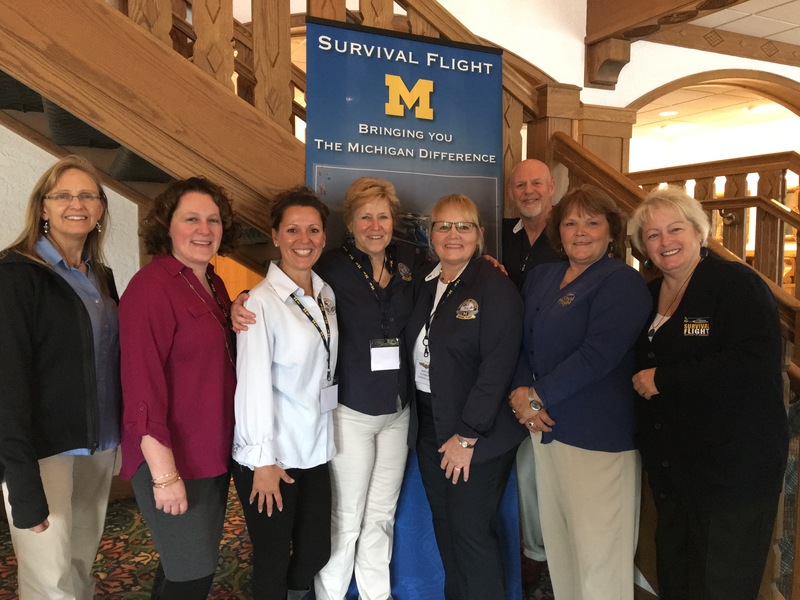 On any trip, Survival Flight may also bring along other medical experts, including neonatal ICU doctors and nurses or Stroke Team members. “Depending on the patient, various departments work together to make this all possible,” Sherony said. Upon return to Michigan Medicine, communication specialists have personnel ready on the ground — doctors, nurses and operating rooms are waiting and a bed is secured for the incoming patient. 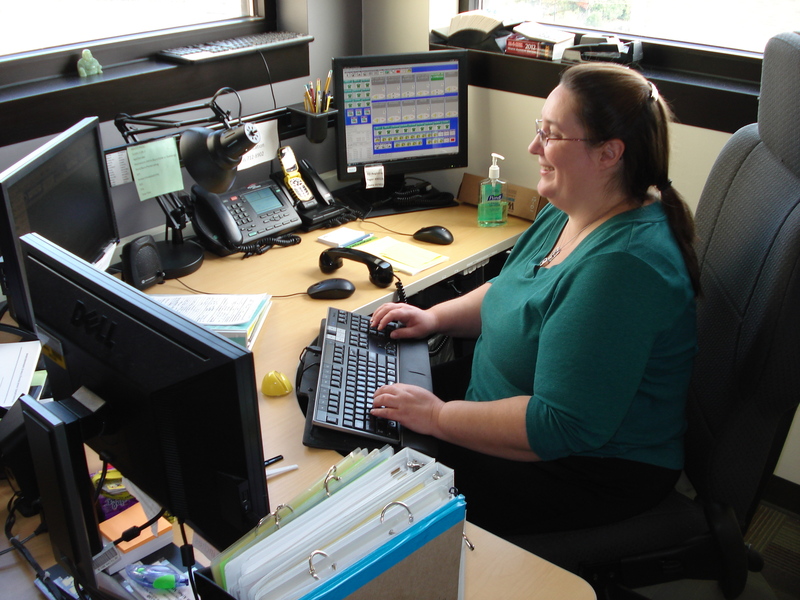 “It may seem complicated, but everyone in the department is so experienced and so professional that it runs very smoothly,” Robinson said. 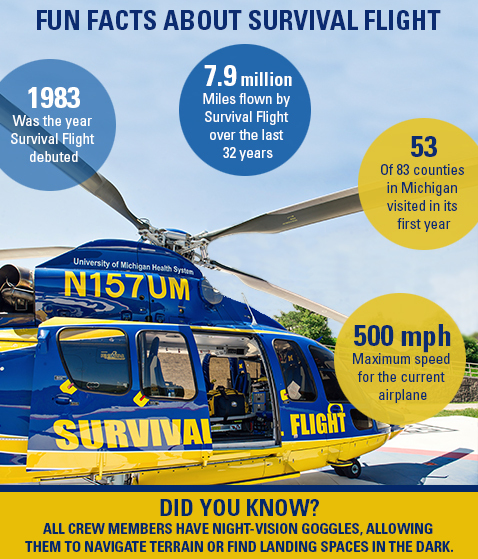 The Survival Flight crew successfully carries out between 1,200 and 1,400 missions a year. Even so, Sherony said the group is “just a small piece of a huge and impressive puzzle. We have the ability to get patients to Michigan Medicine, where there are amazing resources and colleagues ready to help. Click here to learn more about Survival Flight and watch the video above to see a day in the life of a Survival Flight nurse. Want your colleagues to better know your department? Let us know!